Here’s how The Denver Post would look if it really hit the bottom. On the Center for Western Priorities’ bog Friday, Erin Moriarty spotlighted a special advertising section that looks very much like the actual Denver Post. Even the most seasoned Denver Post readers can be fooled by a new advertising ploy from oil and gas front group Coloradans for Responsible Energy Development (CRED), in which fake, industry-sponsored news stories are being published as part of a special “Energy and Environment” section on the newspaper’s website. Each CRED-authored story uses the same font and layout as real Denver Post articles from real Denver Post reporters, undoubtedly attempting to pass CRED’s message off as real news. But, it’s not. It’s yet another paid effort that CRED is using to validate its now-dwindling credibility. CRED is no stranger to promoting its message through paid advertising, as can be seen by the television, radio, online, and bus advertisements that the group has been running since its inception in September 2013. This time, the ad on Denver Post’s website boasts “news” about oil and gas development in the state, when really, the group is just peddling its own version of facts. In the “Energy and Environment” section on the Denver Post’s website, CRED’s advertorial features several stories on natural gas exports, local control amendments, and other energy issues Coloradans have been following for months. The online version of the CRED ad is labeled in large letters across the top, “This Advertising Section is Sponsored by [CRED logo].” And “Advertising Supplement to The Denver Post” appears on top, in small, but not tiny, font. Post reporter Mark Jaffe did the right thing by tweeting readers a warning about the fake content last week. “Faux Denver Post. Industry group’s paid article looks a lot a Post story — it isn’t,” Jaffe tweeted April 9. 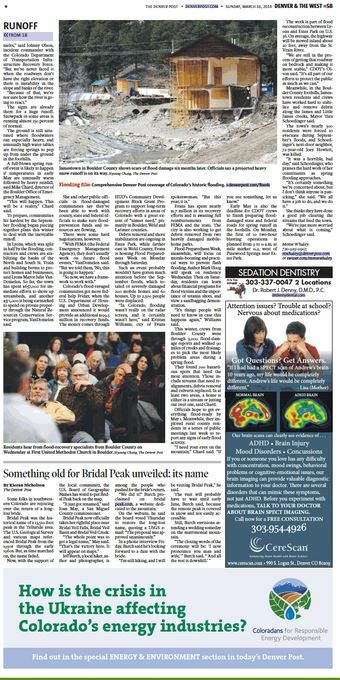 The six-page print version of the ad supplement, which appeared March 16, doesn’t even have the headline, “This Advertising Section is Sponsored by,” and is over-the top deceptive, with the by-lined “articles” and news format, even though “Advertising supplement to The Denver Post” appears on top of each page in font equal to the size of the date. The print supplement states that another “Energy and Environment” Section will be published April 20, next weekend. The Post should use the same large-font “Advertising Supplement” headline in it’s April 20 print version of its “Energy and Environment” ad supplement as it uses online. So-called “sponsored content” like this is nothing new, and its use is on the rise, as newspapers struggle financially. Newspapers could easily die whether they push fake news or not, but at this point, credibility is still the newspaper industry’s most valuable asset, its point of differentiation from blogs, vlogs, Facebook posts, tweets, even local TV, etc. The Post should take a clue from its own reporter, Jaffe, and do a better job warning its readers about the fake content of its next “Energy and Environment” section. This entry was posted on Sunday, April 13th, 2014 at 1:48 pm	and is filed under Denver Post. You can follow any responses to this entry through the RSS 2.0 feed. You can skip to the end and leave a response. Pinging is currently not allowed.